Have you found an online vendor selling Hamilton Guyana 151? There aren't many 151 proof rums that are actually delicious, but this one is. You could try it in this order: first, sip some straight up. Yes, it's really fiery, but the unmistakable Demerara smokiness and burnt butter flavors shine. Next, drop in an ice cube and wait a minute. Better, right? Hints of tobacco, oak and butterscotch. And finally, add it to your Tiki cocktails whenever the recipes call for overproof rum. Indispensable. Even more dramatic than the 86 proof. Everything is amplified, with new qualities brought to the table like a pronounced smokey and toasted character. People complain about sipping a 151 straight as if its a defect with the rum - its supposed to be hot, overwhelming, and concentrated - that's the point of a rum that's over 75% abv. However, this is one of the few overproofs that I can actually manage to sip and enjoy neat, maybe with a little water. Expect tongue-coating richness like with the 86 proof, and an even more dramatic spicy cinnamon/caramel finish that never seems to lose its intensity. This is exceptional rum, made intentionally as a mixer for tiki and fruit drinks, like the zombie. For $25, there's no reason to avoid having it on the shelf. If you want to try it without cutting it, take tiny sips or you will numb your palate too much to taste it. I love the 86 proof Hamilton but cut to around 100 proof this stuff is fantastic. Also great to ratchet up the intensity of your Tiki drinks. I've never had the original Lemonhart 151, which is legendary. I have a bottle of the newer version, but have not opened it. I don't know how it could get any better than this. I'll admit, I was afraid of this one when I first picked up a bottle for the sole purpose of making zombies. I had all those awful memories, as most of us do, of Bacardi 151 mixed into drinks with names like The Gorilla Fart and such. But time passes, and we forget how we almost died of alcohol poisoning, and we are convinced by a blog post that it's time for a different kind of 151. And boy, is this ever different. If you've never had a demerara rum, it's like going from only drinking American pale ales to getting a hefty pour of stout. The demerara character makes it taste like burnt caramel with almost a rich chocolate undertone. And while it's hot at 151 proof, it's not much hotter than an unfiltered bourbon like Booker's. While you're probably not going to be drinking it on its own very often, you certainly could. For something as strong as Everclear, it goes down surprisingly easy. The best way to experience it is to make a classic demerara dry float as described in the Smuggler's Cove recipe book (there are probably other other sources as well). Leave the Hamilton 151 on the side in a tumbler and try a few sips without it. Then, pour about a quarter of the 151 into the drink and see how it changes the flavor. Finally, dump the rest into the drink, and experience it at its fullest. While I use this exclusively as a float or a mixer in classic tiki drinks, I must admit I always save a few drops in the jigger to drink straight at the end. It's that good. Can't get Lemonhart, but I can get this and its great. Dark, smokey with hints of vanilla and molasses, great for floating or mixing when a dark rum is called for in tiki recipes. Also added points for being a great value buy! 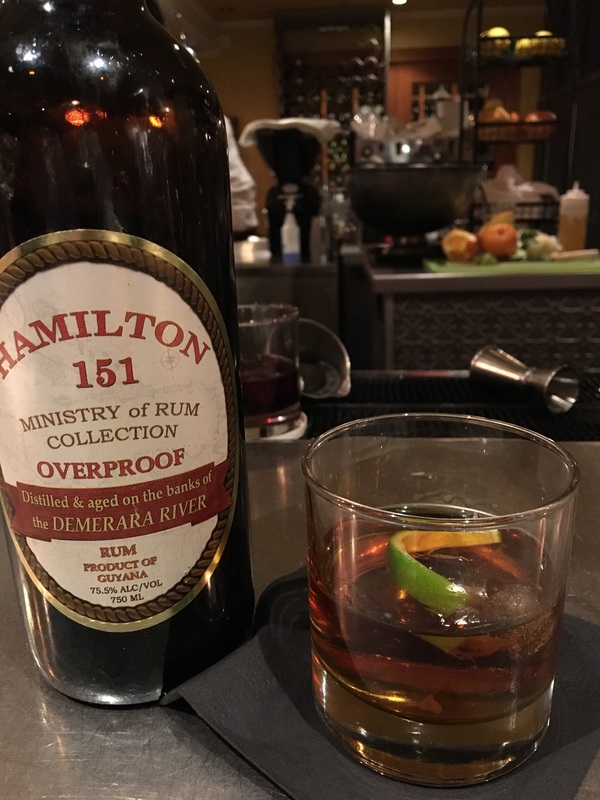 Tried a glass of Hamilton 151 Rum while in San Francisco. Cheap looking bottle and label design. Extremely strong and potent rum mixed with oak, glue and pure alcohol to your nose and palate. Super strong burn at the end. Nasty stuff. Tasted side by side with Plantation OFTD, I liked the Hamilton neat better than Planation since Hamilton was pure Demerara, was more rich, like the brown sugar taste. This is not for sipping. Extremely similar to Lemon Heart if not a little more refined. I have read that all Guyana rum is processed at the same distillery. Can’t go wrong here for mixing or even sipping with a water-back. Insanely strong nose. You can smell and sip it neat, but a few drops of water help. Deep, rich caramel. I prefer it to the current Lemon Hart 151. It's also the same stock as Hamilton Guyana 86, just not diluted. So theoretically one bottle can do double-duty! I've heard a lot of people say this was the replacement for the classic Lemon Hart 151. Well, in it's absence, sure, this will work; it has good flavor, but not as rich, and a bit thin. Works nicely in cocktails. A good value. I love all of Hamiltons productions. So much flavor in all. This is a great rum for tiki drinks needing demerara and overproof rums. I had this side by side with the Lemon Hart 151, both straight, and both with a little water mixed in. Both are from Guyana. I liked the Lemon Hart more. This was dryer that the Lemon Hart. Tastes and smells of molasses, tobacco, and oak. I prefer slightly sweeter rum. Strong, but not unpleasant at all with just a bit of lime juice & sugar syrup. Smoky, oily, nutty, somewhat floral. Really well done overproof. Overproof rum with rich flavors of stone fruit and wood.